This hat is too small. I had planned to make another watch cap like my first hat (with fewer stitches around this time), but I wanted something to work on during the quilt guild meeting and hadn’t gotten around to buying smaller needles to do the ribbing part, so I printed out the London Beanie pattern, which uses only needles I already have. I grabbed the leftover yarn from my Slytherin scarf and headed off. I did the cable cast-on without even looking at the book (adding 10 stitches to what the pattern calls for–9 to size up for my big head and one extra to try the technique I’d read about to disguise the starting join–casting on one more stitch than needed, then transferring one stitch from the left needle to the right before knitting those two together to start the first round; it worked well). I merrily did K2 P1 ribbing for 10 rows without incident. Then the pattern said to do a round with an increase every nine stitches. Hmm. Increases. 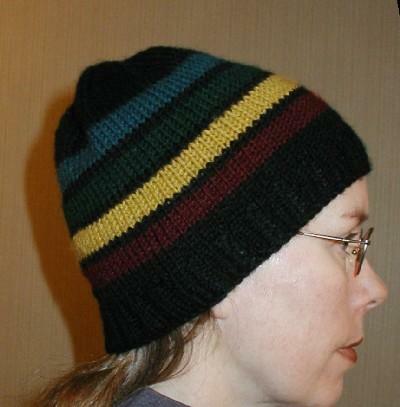 The other hat didn’t have increases, and I hadn’t studied up on them before heading to guild with my knitting. I figured something out–pulling a loop from the row below up and knitting into that in between stitches–and it looked okay so I kept going. When I got home, I consulted my books and what I’d done sort of matched one of the methods shown. I’d read that a lot of people found these hats too short when made to pattern, so I added a few rows before the decreases (which I did a different way than the first hat and found that knitting two together through the back loops doesn’t look that great on top of a hat) and a couple in between decrease rows. I should have added a few more, as I wish it had finished longer. Still, it’s wearable. That’s a good confidence builder. This hat is too big. 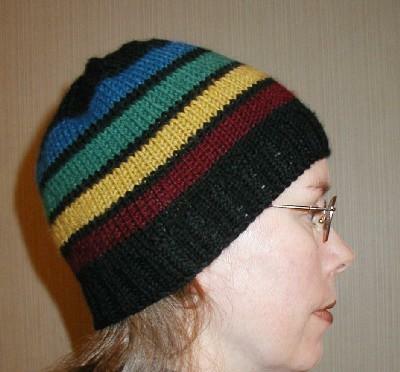 Searching around the web, I found this pattern, an adaptation of the London Beanie. Since I was running low on leftover yarn, I went and bought black and wine and yellow to add to the blue and green I had to make a hat inspired by what the hp_knitting community has been calling the “house unity scarf” from Goblet of Fire (since well before Warner Bros. came out with the official merchandise version). When casting on for this one, I looked at the book to check that I was doing it right, and realized I wasn’t–and I hadn’t done it right for the green hat either (and maybe not the blue one, either). I wasn’t twisting the new stitch as I put it on the left needle. I ripped out three rounds and started over, then had trouble getting the round join to look good as green one. So I did some research and found that the way I had done it in the first place (no twist) is a legitimate approach after all, but didn’t feel like undoing my cast-on yet again. Then I decided that just because the book says to put the needle with the last cast on stitch in your right hand doesn’t mean you have to do it that way, so I put it in my left hand (which is where I think it would be if I were knitting on straights, but it’s been so long since I did that that I may be quite wrong) and got a nice join and moved on. I followed the pattern directions for the med-large size, but left out five of the 40 rows called for in the main body section. It still finished too tall for my liking.